Just getting started. We here at The Crush, as we call it, will be adding different stories and showcasing what we find interesting in the world of Monster Mania. Right now, the big vibe is coming from Monster High, and the wave it has created, lifting all of our boats in a rising tide of a wonderful fright filled mania. Monster High was started- and is owned by Mattel. 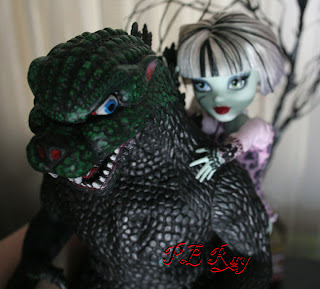 Monster High has been hijacked like Fay Wray of King Kong fame by fans around the world. We want to make them our own. I am known around here as The Big GZ, GZ or sometimes, Big Guy. I will be doing most of the writing with some guest writers featured here and there. Our Editor and Chief Monster Wrangler is PB Ray. >An interview with Frankie Stein about her career and her future plans, complete with a photo shoot you do not want to miss. >A review of the latest from Dolly Dolly Fashions with a photo layout of some of the best fashions a ghoul could want to own. >How to bits about custom and original character MH dolls and other stories about other monsters and monster makers. Is there something you want to know about? Got a favorite fan site you want to share? Tell me about it and I will include it here. Now, don't you wish you were me? !